To investigate the significance of Aurora B expression in hepatocellular carcinoma (HCC). The Aurora B and Aurora A mRNA level was measured in 160 HCCs and the paired nontumorous liver tissues by reverse transcription-polymerase chain reaction. Mutations of the p53 and β-catenin genes were analyzed in 134 and 150 tumors, respectively, by direct sequencing of exon 2 to exon 11 of p53 and exon 3 of β-catenin. Anticancer effects of AZD1152-HQPA, an Aurora B kinase selective inhibitor, were examined in Huh-7 and Hep3B cell lines. Aurora B was overexpressed in 98 (61%) of 160 HCCs and in all 7 HCC cell lines examined. The overexpression of Aurora B was associated with Aurora A overexpression (P = 0.0003) and p53 mutation (P = 0.002) and was inversely associated with β-catenin mutation (P = 0.002). Aurora B overexpression correlated with worse clinicopathologic characteristics. Multivariate analysis confirmed that Aurora B overexpression was an independent poor prognostic factor, despite its interaction with Aurora A overexpression and mutations of p53 and β-catenin. In Huh-7 and Hep3B cells, AZD1152-HQPA induced proliferation blockade, histone H3 (Ser10) dephosphorylation, cell cycle disturbance, and apoptosis. Aurora B overexpression is an independent molecular marker predicting tumor invasiveness and poor prognosis of HCC. Aurora B kinase selective inhibitors are potential therapeutic agents for HCC treatment. Hepatocellular carcinoma (HCC) is the leading cause of cancer mortality in Taiwan  and many other countries in Asia and Africa . The incidence of HCC is increasing in Europe and the United States . In 2002, HCC became the sixth most common cancer worldwide with 626,000 annual new cases . Despite surgical resection, which provides an opportunity for cure, the majority of patients with HCC have a dismal prognosis  because tumor recurrence frequently develops and usually leads to patient's mortality . The development of HCC is closely related to chronic hepatitis B or C, cirrhosis of any etiology, and aflatoxin B1 exposure . However, the detailed molecular mechanisms of hepatocarcinogenesis are still not fully understood ; molecular factors capable of predicting clinical outcome of HCC and acting as potential therapeutic targets remain limited. The identification of molecular markers related to hepatocarcinogenesis, tumor progression, and poor clinical outcome would benefit patients, providing for better management planning and serving as potential therapeutic targets for novel HCC drug treatments. Genomic instability has been correlated with hepatocarcinogenesis , and increased chromosomal instability has been associated with differentiation status of human HCC . Aurora kinases, a subfamily of serine/threonine mitotic kinases, are thought to be key molecules required for maintaining accurate cell cycling and genomic stability . We previously showed that Aurora A was overexpressed in 137 (61%) of 224 human HCCs and that the overexpression of Aurora A was associated with aggressive tumor characteristics and poor prognosis of patients . Furthermore, we demonstrated that VE-465, a novel pan-Aurora kinase inhibitor, had anticancer effects in preclinical models of human HCC . These findings indicated that Aurora kinases may be important biomarkers and potential therapeutic targets in HCC. There are three highly related Aurora kinases in mammals, Aurora A, B, and C. Aurora A and Aurora B share a high degree of sequence homology in their catalytic domains, and overexpression of each has been identified in many human cancers . Despite their sequence similarity, Aurora A and Aurora B differ in chromosomal gene loci, subcellular localization, cellular functions, and signaling substrates . The Aurora A kinase gene is localized to chromosome 20q13.2, and that for Aurora B kinase is localized to chromosome 17p13.1. Aurora A kinase protein is localized in the centrosome and spindle poles and plays important roles in centrosome maturation and spindle assembly . Aurora B kinase, which is a chromosome passenger protein localized in the centromeres during early mitosis and then at the spindle midzone after anaphase, is essential for chromosome biorientation, function of the spindle assembly checkpoint, and cytokinesis . The enthusiasm of exploring Aurora kinases as anticancer therapeutic targets initially centered on Aurora A, but recent studies have demonstrated that several Aurora kinase inhibitors exhibit anticancer activity resembling that of Aurora B disruption induced by genetic methods . Therefore, determination of the distinctive roles in carcinogenesis and individual clinical significance of Aurora A and Aurora B is mandatory. The aims of this study were to elucidate the clinicopathologic significance of Aurora B expression and Aurora A expression in HCC and to correlate their expression with p53 and β-catenin mutations, the two most frequently mutated genes in HCC [7, 11]. During the period January 1987 through December 1997, 160 surgically resected, primary unifocal HCCs were selected for this study. After resection, tumor tissues were immediately cut into small pieces, snap frozen in liquid nitrogen, and stored in deep freezer. Patients had received comprehensive pathologic assessment and regular follow-up at National Taiwan University Hospital, as described previously [17, 18]. This study was compliant with the regulations of the Ethics Committee of the host institution. The 160 patients included 122 men and 38 women with a mean age of 57 years (range, 14-88 years). Serum hepatitis B surface antigen (HBsAg) was detected in 107 cases (67%) and antihepatitis C virus antibody in 53 (35%), including 13 positive for both. Elevated α-fetoprotein (AFP; ≥200 ng/mL) was detected in 80 cases (50%). Liver cirrhosis was found in 61 patients (38%). All patients had adequate liver function reserve at the time of surgery. None of the patients had received local or systemic therapy before surgery. Tumor grade was divided into 3 groups: well-differentiated (grade I, 31 cases), moderately differentiated (grade II, 74 cases), and poorly differentiated (grade III-IV, 55 cases). The unifocal HCC was staged as stages I, II, IIIA, IIIB, and IV, as described previously [11, 19, 20]. Staging was based on the International Union Against Cancer criteria, with slight modification because HCC tends to spread in the liver via vascular invasion, which is an important unfavorable prognostic factor for this disease . Stage I HCC included tumors that were ≤ 2 cm and showed no evidence of liver and vascular invasion (4 cases). Stage II HCCs included tumors that were ≤ 2 cm for which vascular invasion was limited to small vessels in the tumor capsule, as well as encapsulated tumors > 2 cm with no evidence of liver or vascular invasion (62 cases). Stage IIIA HCCs included invasive tumors > 2 cm with invasion of small vessels in the tumor capsule and/or satellites near the tumor, but no portal vein invasion (25 cases). Stage IIIB HCCs included tumors with invasion of the portal vein branch near the tumor, but not of the distant portal vein in the liver parenchyma (23 cases). Stage IV included tumors with involvement of major portal vein branches, satellites extending deeply into the surrounding liver, tumor rupture, or invasion of the surrounding organs (46 cases). No evidence of regional lymph node or distant metastasis was noted at the time of surgery in any of the cases. Among the 160 patients studied, 149 were eligible for the evaluation of early tumor recurrence (ETR; ≤12 months). Eleven patients who died within 1 year after surgery without objective evidence of tumor recurrence were excluded from the evaluation of ETR. Reverse transcription-polymerase chain reaction (RT-PCR) was used to determine the mRNA levels of Aurora A and Aurora B in paired HCCs and nontumorous liver samples, as described elsewhere [11, 22]. The ribosomal protein S26 mRNA, a housekeeping gene, was used as an internal control . Briefly, total RNA was isolated from the frozen tissues using a guanidium isothiocyanate/CsCl method. RNA was quantified by spectrophotometry at 260 nm. Stock RNA samples were kept in alcohol in deep freezer until used. Complementary DNA (cDNA) was prepared from the total RNA of paired HCCs and nontumorous liver samples. Two microliter reverse transcription product, 1.25 units Pro Taq polymerase (Protech Technology Enterprise, Taipei, Taiwan), Pro Taq buffer, and 200 μM dATP, dCTP, dGTP, and dTTP (each) were mixed with primer pairs for Aurora A, Aurora B, and S26 in a total volume of 30 μl. One-tube PCR reaction was stopped at the exponential phase of gene amplification: 29 cycles for Aurora A, 32 for Aurora B, and 23 for S26. The reaction was performed in an automatic DNA thermal cycler (model 480; Perkin-Elmer Co., Wellesley, MA), with limited reaction reagents (Tag enzyme and dNTPs), and processed with initial heating at 94°C for 2 minutes, followed by 29 (Aurora A) or 32 (Aurora B) PCR reaction cycles of 94°C for 30 seconds, annealing at 60°C for 1 minute, extension at 72°C for 1 minute, and a final 72°C extension for 10 minutes. The PCR reaction was stopped at cycle 7 (Aurora A) or 10 (Aurora B), and the reaction tubes were quenched on ice to allow adding S26 primers, then complete the final 23 PCR reaction cycles. Primers for amplified genes were as follows: Aurora A-F (AATTGCAGATTTTGGGTGGT), Aurora A-R (AAACTTCAGTAGCATGTTCCTGTC), Aurora B-F (ATCGTGGCGCTCAAGGTCCT), Aurora B-R (GATGCACTCTCAAAGGGTGGG), S26-F (CCGTGCCTCCAAGATGACAAAG), S26-R (GTTCGGTCCTTGCGGGCTTCAC). The PCR products were electrophoresed on a 2% agarose gel. Concentrations of the PCR fragments were determined with the IS-1000 digital imaging system (Alpha Innotech, San Leandro, CA). The Aurora A and Aurora B mRNA levels were determined according to the ratio of signal intensity for Aurora A or B to that of S26 as measured by 1 D Image Analysis software (Kodak Digital Science, Rochester, NY) and scored as high (ratio >1.0), moderate (ratio > 0.5 and ≤1.0), or low (ratio ≤0.5). The Aurora A and Aurora B mRNA levels of nontumorous liver rarely exceeded a ratio of 0.5, and a ratio > 0.5 was regarded as overexpression. Mutations of the p53 and β-catenin genes were analyzed in 134 and 150 tumors, respectively, by direct sequencing of exon 2 to exon 11 of p53 and exon 3 of β-catenin, as described previously [17, 24, 25]. Samples with incomplete study results were excluded from statistical analysis. Early tumor recurrence (ETR) was designated as intrahepatic tumor recurrence or distant metastasis detected by imaging tools, pathology and/or high AFP levels within 12 months. All 160 patients had been followed for more than 5 years or until death. At the end of the follow-up in November 2008, 37 patients remained alive. One hundred forty-nine cases (93%) were eligible for evaluation of ETR. Seventy-three (46%) cases had ETR. Among the 73 patients, 11 (15%), 26 (36%), 7 (10%), 1 (1%) received tumor resection, transhepatic arterial embolization, chemotherapy, or radiotherapy, respectively. Fifty-one (32%) of the 160 cases had late tumor recurrence more than 12 months after the initial hepatectomy. Among the 51 patients, 18 (35%), 24 (47%), 4 (8%), 2 (4%) received tumor resection, transhepatic arterial embolization, chemotherapy, or radiotherapy, respectively. The liver cancer cell lines Huh-7, HepG2, Hep3B, PLC5, HCC36, HA59T, SK-hep-1, and Tong were cultured in Dulbecco's modified Eagle's medium (DMEM) plus 10% fetal bovine serum (FBS), supplemented with penicillin and streptomycin. Cells were maintained in a humidified incubator with 5% CO2 in air at 37°C. AZD1152-HQPA is a selective inhibitor of Aurora B (inhibition constant Ki, 0.36 nM) compared with Aurora A (inhibition constant Ki, 1369 nM) . AZD1152-HQPA, provided by AstraZeneca Pharmaceuticals (Macclesfield, UK), was used for in vitro cell line studies. Western blotting was performed as described previously . The following primary antibodies were used: anti-Aurora B (Novus Biologicals, Littleton, CO, USA), anti-Aurora A (Novus Biologicals), anti-α-tubulin antibody (Sigma-Aldrich, St. Louis, MO, USA), anti-phosphorylated histone H3 (Ser10) (Santa Cruz Biotechnology, Inc., Santa Cruz, CA, USA), and anti-phosphorylated Aurora A (T288) (Cell Signaling Technology, Inc., Danvers, MA, USA). The final images were developed with a chemiluminescence reagent. A total of 5 × 104 Huh-7 or Hep3B cells were plated in six-well plates. After overnight culture, cells were treated with DMSO or 1, 5, 25, and 125 nM of AZD1152-HQPA. At 72 hours of drug treatment, cells were trypsinized and the total number of cells were counted using hemocytometer. Trypan blue dye exclusion assay was used to determine the number of viable cells. The experiments were carried out in 3-4 replicates and repeated trice. Cells in logarithmical growth were incubated with either AZD1152-HQPA or DMSO for 24 to 48 hours. Cells were labeled with 0.5~1 mL propidium iodide (50 μg/mL) after being trypsinized and fixed in 70% methanol overnight. Cell cycle profiles and sub-G1 fractions were determined using a FACS caliber (Becton Dickinson, San Jose, CA, USA). Data analyses were carried out with Statistical Analysis System software (version 9.1; SAS Institute, Inc., Cary, NC). Two-tailed P < 0.05 was considered statistically significant. The χ2, Fisher's exact test, and log-rank test were used for univariate analyses. Multivariate analyses were conducted for ETR, tumor size, stage, and grade by fitting multiple logistic regression models . Time to death was analyzed by fitting multiple Cox's proportional hazards models . In our regression analyses, basic model-fitting techniques for (a) variable selection, (b) goodness-of-fit assessment, and (c) regression diagnostics (including residual analysis, influence analysis, and check of multicollinearity) were used to ensure the quality of the analysis results [27, 28]. For the in vitro studies, the mean differences among groups were tested by one-way analysis of variance (ANOVA) followed by multiple comparisons using the Dunnett's post hoc test or the Bonferroni's correction of alpha level. Using RT-PCR in the linear range, Aurora B mRNA overexpression was detected in 98 (61%) of 160 surgically resceted, primary unifocal HCC specimens (Fig. 1A). Of these 160 HCCs, RNA samples of nontumorous liver were examined in 153 cases. In nontumorous liver, overexpression of Aurora B mRNA at a moderate level was detected in 2 cases (1.3%). We then examined Aurora B gene expression in cell lines, and all 7 liver cancer cell lines showed high expression levels of Aurora B mRNA, which correlated with protein levels (Fig. 1B). Overexpression of Aurora B in hepatocellular carcinoma. (A) Aurora B mRNA expression in paired hepatocellular carcinoma (H) and nontumorous liver parenchyma (L) was measured by quantitative RT-PCR in the exponential phase of amplification. Overexpression of Aurora B (Aurora B/S26 ratio > 0.5) was detected in 9 of 13 representative tumor samples and in 2 nontumorous liver tissues. Tumor stage and tumor size are depicted above. (B) Protein lysates and mRNA from nontumorous liver tissues and 7 liver cancer cell lines were analyzed by immunoblotting and quantitative RT-PCR. All 7 liver cancer cell lines show overexpression of Aurora B at protein level (top panel). The mRNA expressions were correlated with protein levels (bottom panel). To elucidate the biologic significance of Aurora B in HCC, we correlated Aurora B expression with major clinicopathologic features of HCC. As shown in Table 1, Aurora B overexpression was associated with high serum AFP level (≥200 ng/mL; P < 0.0001), but not with age, gender, chronic hepatitis B/C virus infection, or liver functional reserve (Child-Pugh class). Histologically, Aurora B overexpression did not correlate with the presence of liver cirrhosis. Nevertheless, HCCs with Aurora B overexpression were associated with large tumor size (> 5 cm; P = 0.021), high-grade histology (P = 0.0007), and advanced tumor stage (P < 0.0001). Genes for p53, β-catenin, and Aurora A are most frequently deregulated in HCC and are closely associated with HCC progression [7, 11]. Therefore, relations between Aurora B overexpression with mutations of p53 and β-catenin and with Aurora A overexpression were analyzed. Table 1 shows that Aurora B overexpression was correlated with Aurora A overexpression (P = 0.0003) and p53 mutation (P = 0.002). In contrast, Aurora B was more frequently overexpressed in HCCs without β-catenin mutation (P = 0.002). HCC with Aurora B overexpression were associated with worse 5-year survival than HCC without Aurora B overexpression (P < 0.0001; Table 1 and Fig. 2A). Moreover, HCC with Aurora B overexpression showed more frequent ETR (P < 0.0001; Table 1), the most crucial clinical event associated with poor prognosis of HCC after hepatectomy [6, 19]. As listed in Table 2, multivariate analysis showed that Aurora B overexpression (odds ratio [OR], 4.679; P = 0.0011], tumor size (OR, 3.735; P = 0.0031), tumor stage (OR, 3.611; P = 0.0073), and age ≤55 years (OR, 1.043; P = 0.0245) were significant independent risk factors by Cox's proportional hazards model for the occurrence of ETR. 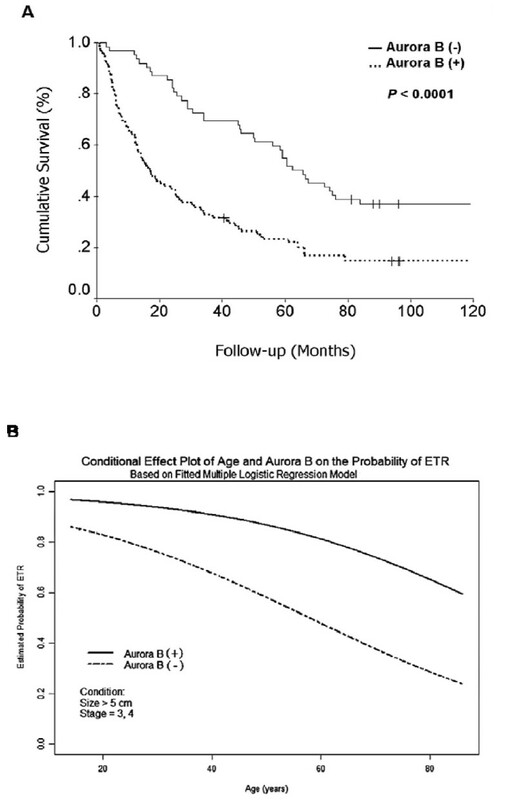 A conditional effect plot of age and Aurora B overexpression on ETR was drawn based on the multiple logistic regression model with fixed tumor size and stage (Fig. 2B). The probability of ETR was significantly higher in patients with HCC showing Aurora B overexpression. Furthermore, ETR (OR, 29.181; P < 0.0001), tumor grade (OR, 1.516; P = 0.0041), and tumor size (OR, 1.072; P = 0.0048) were significant independent risk factors associated with poor patient survival (Table 2). Principally, we found that Aurora B overexpression was an independent risk factor associated with high-stage tumor (OR, 7.439; P = 0.0003; Table 2) and ETR (OR, 4.679; P = 0.0011), hence contributing to poor patient survival. Nevertheless, Aurora B overexpression did not exert prognostic effects for tumor size or tumor grade (Table 2). Aurora B overexpression predicts early tumor recurrence and poor prognosis. (A) Cumulative survival curve for 160 patients with primary unifocal hepatocellular carcinoma (HCC). HCC with Aurora B mRNA overexpression, designated Aurora B (+), had significantly worse 5-year survival than HCC without Aurora B mRNA overexpression, designated Aurora B (-). (B) Conditional effect plot of age on ETR with or without overexpression of Aurora B mRNA. Based on multiple logistic regression model (n = 149). The other independent variables were fixed as size > 5 cm and stage III-IV. aLogistic regression model: n = 149, percentage of concordant pairs = 86.5%, percentage of discordant pairs = 13.3%, adjusted generalized R2 = 0.3755, Hosmer and Lemeshow goodness-of-fit test P = 0.4583 (degrees of freedom = 8). bLogistic regression model: n = 120, percentage of concordant pairs = 84.3%, percentage of discordant pairs = 14.4%, adjusted generalized R2 = 0.3507, Hosmer and Lemeshow goodness-of-fit test P = 0.3603 (degrees of freedom = 8). cLogistic regression model: n = 125, percentage of concordant pairs = 90.9%, percentage of discordant pairs = 8.9%, adjusted generalized R2 = 0.4647, Hosmer and Lemeshow goodness-of-fit test P = 0.7933 (degrees of freedom = 8). dLogistic regression model: n = 123, percentage of concordant pairs = 65.8%, percentage of discordant pairs = 21.6%, adjusted generalized R2 = 0.2291, Hosmer and Lemeshow goodness-of-fit test P = not applicable. Because both Aurora A and Aurora B correlate closely with unfavorable prognosis of HCC and may be potential therapeutic targets [11, 12], we analyzed the possible interplay between these two important biomarkers. In this study, Aurora A overexpression, which was found in 100 (63%) of 160 HCCs examined, significantly correlated with Aurora B overexpression (P = 0.0003; Table 1). Moreover, as shown in Table 3, HCC with overexpression of both Aurora A and Aurora B showed the highest occurrence of high serum AFP level (≥200 ng/mL; 71%), large tumor size (> 5 cm; 72%), grade II to IV tumor (94%), stage IIIA to IV tumor (82%), p53 mutation (64%), wild-type β-catenin (92%), and the worst 5-year survival rate (19%) than the other groups. Because Aurora B overexpression was correlated with Aurora A overexpression (P = 0.0003), p53 mutation (P = 0.002), and infrequent β-catenin mutation (P = 0.002) in this study (Table 1), we then analyzed the prognostic value of Aurora B overexpression for patient survival in relation to Aurora A overexpression and p53/β-catenin mutations. We showed that HCC with Aurora B overexpression was associated with worse 5-year survival regardless of Aurora A expression status (P = 0.013 for HCC without Aurora A overexpression and P = 0.001 for HCC with Aurora A overexpression; Fig. 3A), p53 mutation (P = 0.016 in wild-type p53 HCC and P = 0.123 in p53-mutated HCC; Fig. 3B), and β-catenin mutation (P = 0.329 in β-catenin-mutated HCC and P < 0.001 in wild-type β-catenin HCC; Fig. 3C). 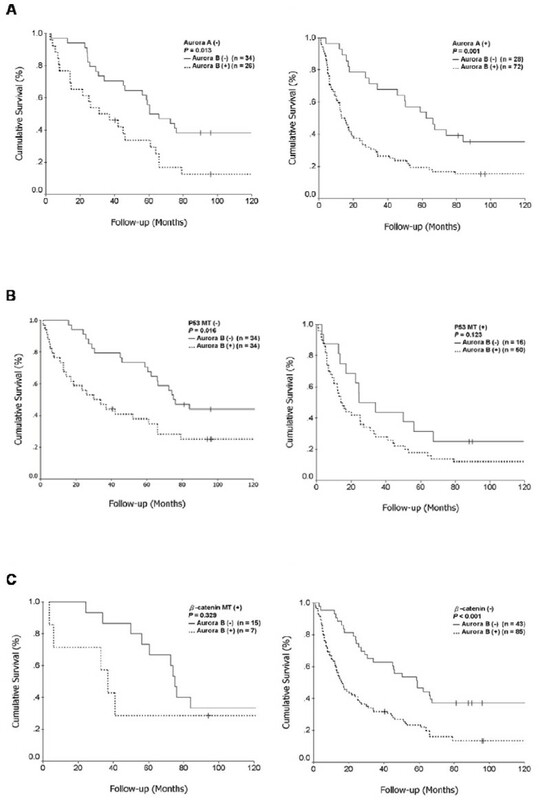 Cumulative survival curve for HCC in relation to increased or normal expression of Aurora B and the presence or absence of Aurora A overexpression (A), p53 mutation (B), and β-catenin mutation (C). The association of Aurora B overexpression and tumor invasiveness of HCC prompted us to explore the effects of Aurora B kinase inhibition on HCC cell viability. Huh-7 and Hep3B cells were treated with increasing concentrations of an Aurora B selective small-molecule inhibitor, AZD1152-HQPA, for 72 hours. Concentration-dependent inhibitory effects of cell viability were observed in both cell lines (Fig. 4A). The ratios of viable Huh-7 and Hep3B cells consistently decreased with higher concentrations of AZD1152-HQPA. The 50% inhibitory concentrations of cell viability (IC50) at 72-hr were 16.72 ± 2.44 nM and 4.79 ± 1.03 nM for Huh-7 and Hep3B, respectively (Fig. 4A). Aurora A autophosphorylation at T288  and histone H3 phosphorylation at Ser10  represent the activity of Aurora A and Aurora B, respectively. As shown in Fig. 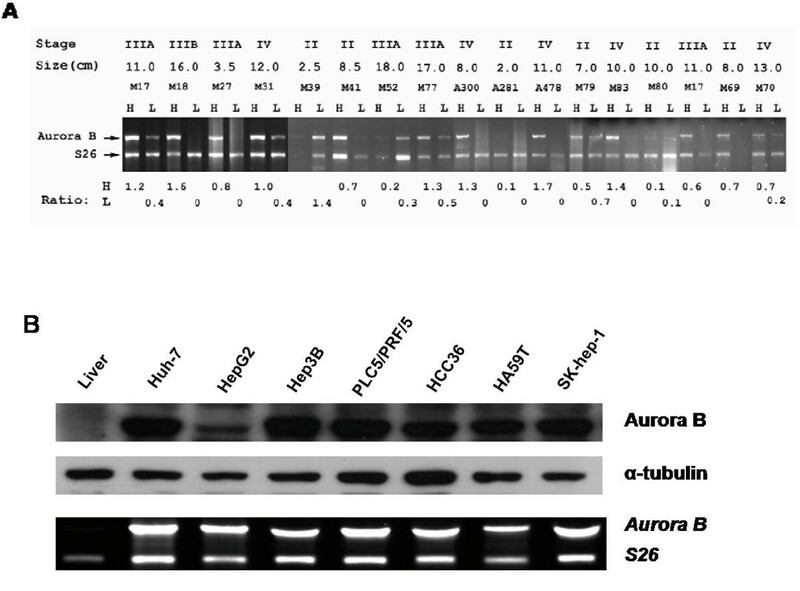 4B, AZD1152-HQPA induced dephosphorylation of histone H3 (Ser10) in a concentration-dependent manner, while the phosphorylation level of Aurora A (T288) did not change. The data suggest that AZD1152-HQPA exerts its anticancer effects in HCC cells through the inhibition of Aurora B.
Aurora B kinase selective inhibitor, AZD1152-HQPA, shows antiproliferative effects in HCC cells. (A) Concentration-dependent inhibitory effects of AZD1152-HQPA on cell viability in Huh-7 and Hep3B cell lines. Cells were treated with AZD1152-HQPA at 1, 5, 25, and 125 nM in 10% FBS-supplemented medium for 72 hours; cell viability was determined by trypan blue assay. Columns: means; bars: SD (n = 3). §, p < 0.05; *, p < 0.01 (compared with untreated controls). The changes in cell counts and morphologic features are shown in the lower panels (magnification, × 100). (B) Huh-7 and Hep3B cells were treated with AZD1152-HQPA for 24 hours. The cell lysates were then immunoblotted. Histone H3 (Ser10) phosphorylation, the key substrate of Aurora B signaling, was downregulated in a concentration-dependent manner. Aurora A (T288) phosphorylation, the key substrate of Aurora A signaling, was not repressed by AZD1152-HQPA treatments. Because Aurora kinase inhibitors have been shown to induce cell death after the cell cycle has been disturbed . We therefore investigated the effects of AZD1152-HQPA on HCC cell cycle progression and apoptosis. As shown in Fig. 5A, AZD1152-HQPA treatment resulted in accumulation of Hep3B cells with 4N DNA contents at 24-h, followed by the appearance of cells with 8N DNA contents at 48-h. Our data demonstrated that AZD1152-HQPA induced cell cycle disturbance in a concentration-dependent manner (Fig. 5A). We also examined the ability of AZD1152-HQPA to induce apoptosis in HCC cells. As shown in Fig. 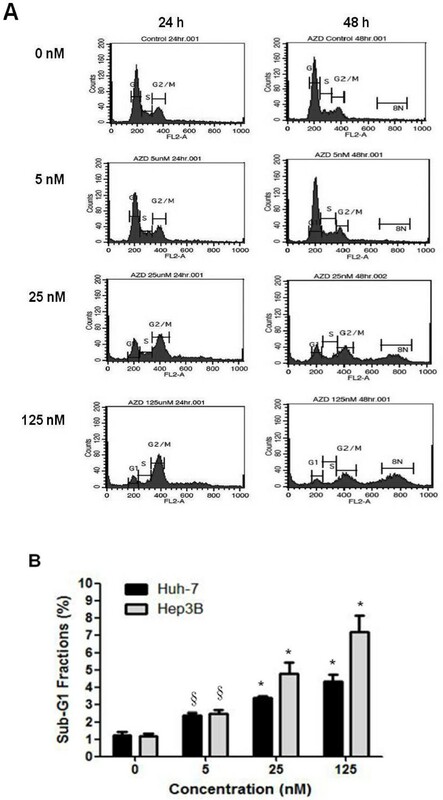 5B, AZD 1152-HQPA induced concentration-dependent apoptosis in both Huh-7 and Hep3B cells. After 48 hours of treatment with AZD1152-HQPA above 25 nM, the sub-G1 fractions of Huh-7 cells and Hep3B cells significantly increased (P < 0.01). In Fig. 5B, AZD1152-HQPA induced apoptosis more efficiently in Hep3B cells, which is in accordance with the antiproliferative effects. AZD1152-HQPA treatment leads to cell cycle arrest, accumulation of cells with ≥4 N DNA content, and apoptosis in HCC cells. (A) Hep3B cells were treated with vehicle or AZD1152-HQPA at 5, 25, and 125 nM for 24 to 48 hours, and then stained with propidium iodide. DNA contents were analyzed by flow cytometry. Data shown are representative of three independent experiments. (B) Percentage of sub-G1 DNA contents in Huh-7 and Hep3B cells treated with vehicle or AZD1152-HQPA at 5, 25, and 125 nM for 48 hours. Columns: means; bars: SD (n = 3). §, p < 0.05; *, p < 0.01 (compared to untreated controls). In mammals, there are three highly related Aurora kinases: Aurora A, B, and C. These 3 closely related kinases share a high degree of sequence homology in their catalytic domains . Despite the sequence homology and common association with mitotic regulatory events, the subcellular localization and signaling substrates differ, and hence the functions of Aurora A and Aurora B are essentially distinct . We have reported that Aurora A is highly expressed in HCC and that overexpression is closely associated with aggressive tumor phenotypes and worse patient prognosis , but the clinicopathologic significance of Aurora B in HCC progression remains to be clarified. In this study, we demonstrated that overexpression of Aurora A and Aurora B was detected in 63% and 61% of 160 surgically resected, primary unifocal HCCs, respectively. Importantly, Aurora B mRNA expression correlated with major clinicopathologic parameters related to tumor progression by univariate analyses, including high AFP level (P < 0.0001), large tumor size (P = 0.021), higher tumor grade (P = 0.0007), and higher tumor stage (P < 0.0001). By multivariate analyses, we showed that Aurora B overexpression was associated with high-stage (stages IIIA, IIIB, and IV) HCC, which exhibits vascular invasion and various extent of microscopic intrahepatic spread (OR, 7.439; P = 0.0003). These findings suggest that overexpression of Aurora B is associated with tumor invasion and intrahepatic metastasis of HCC, as having been shown in Aurora A . Although the diagnosis and management of HCC have progressed significantly, the prognosis for patients receiving surgical treatment remains poor because of the high ETR [6, 31]. Hence, the identification of molecular factors to predict ETR will help develop better strategies for patient management. Here, we showed that HCC with Aurora B overexpression had a greater than 2-fold higher chance of ETR than HCC without the overexpression (OR, 8.71; 95% confidence interval [CI], 4.02-18.91; P < 0.0001). Consistent with its association with high-stage HCC and frequent ETR, HCC with Aurora B overexpression showed worse 5-year survival than those without the overexpression (OR, 4.19; 95% CI, 2.11-8.36; P < 0.0001). The multivariate analysis confirmed that Aurora B overexpression was an independent risk factor associated with ETR (OR, 4.679; P = 0.0011; Table 2). These findings are consistent with the correlation of Aurora B overexpression with poor tumor differentiation and worse patient survival in thyroid , prostate , and hepatobiliary cancers [34, 35]. Taken together, our findings suggest that Aurora B overexpression serves as a useful marker predicting ETR and hence poor prognosis. In the present study, we showed that the expression of Aurora B and Aurora A were closely correlated (P = 0.0003; Table 1) and exhibited an interaction contributing to HCC progression. HCC with overexpression of both kinases exhibited the highest rates of high AFP level (71%), vascular invasion (stage IIIA-IV; 82%), and ETR (74%), 4-fold higher than those without overexpression of either kinase (15%, 15%, and 12%, respectively). Consistently, HCC with overexpression of both kinases showed the lowest 5-year survival (19%), approximately one-third of those without any overexpression (56%). Our findings suggest that Aurora A and Aurora B contribute cooperatively to a more malignant HCC phenotype, ETR, and poor prognosis. HCC has been classified into two major groups according to chromosomal stability status ; tumors characterized by chromosomal instability were associated with more p53 mutation and less β-catenin mutation, the two major genetic mutations in human HCC [17, 24, 25]. Mutation of p53 correlated with aggressive HCC and poor prognosis [24, 25], whereas β-catenin mutation was associated with less tumor aggression and more favorable prognosis . We also showed that Aurora A overexpression correlated positively with p53 mutation and inversely with β-catenin mutation . In the present study, we showed that Aurora B overexpression positively correlated with p53 mutation (P = 0.002) and inversely with β-catenin mutation (P = 0.002). Despite the association with these important molecular factors, Aurora B overexpression predicted worse 5-year survival regardless of Aurora A expression status, p53 mutation, or β-catenin mutation (Fig. 3). Hence, it is suggested that Aurora B overexpression, independent of Aurora A overexpression and p53/β-catenin mutations, is an important molecular factor associated with vascular invasion, leading to high-stage tumor, ETR, and poor prognosis for patients with surgically resected HCC. Since the discovery of Aurora kinases, Aurora A has attracted much attention as an appealing therapeutic target because of its oncogenic potential , and the frequent overexpression of Aurora A in a variety of human cancers . However, subsequent pharmacologic studies demonstrated that dual Aurora A and Aurora B kinase inhibitors produced biologic responses equivalent to Aurora B disruption alone , suggesting that Aurora B is a critical therapeutic target for cancer. We previously reported that a novel dual Aurora A and Aurora B kinase inhibitor, VE-465, had anticancer effects in human HCC . Hence, determining whether Aurora A or Aurora B is the pertinent therapeutic target for HCC is imperative. In the present study, we first showed that Aurora B overexpression was associated with major clinical (high AFP, ETR) and histopathologic (large tumor, higher tumor grade, and higher tumor stage) features, which are critical for tumor progression of HCC, and hence is an independent risk factor for poor prognosis of patients with surgically resected HCC. In addition, we showed AZD1152-HQPA, an Aurora B selective inhibitor, has anticancer effects in HCC cells. 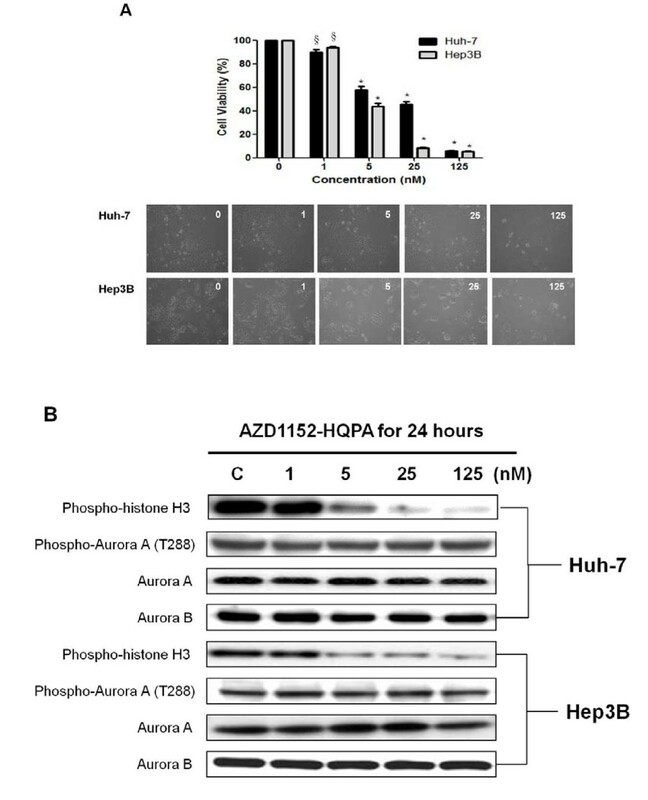 AZD1152-HQPA treatment resulted in profound inhibition of Aurora B signaling, which in turn led to cell cycle disturbance, apoptosis, and growth suppression in HCC cells. Our results suggest that Aurora B selective inhibitors are potential drugs for HCC treatment, confirming the observation that AZD1152 is a novel promising therapeutic approach for HCC . Nevertheless, whether targeting Aurora B kinase alone is a better therapeutic strategy, compared with the targeting of both Aurora A and Aurora B kinases, will require further exploration. In this study, we showed frequent overexpression of Aurora B in HCC, which was closely associated with aggressive tumor phenotypes. Aurora B overexpression, independent of Aurora A overexpression and p53/β-catenin mutations, is an important molecular marker associated with early recurrence and poor prognosis. Besides, an Aurora B kinase selective inhibitor, AZD1152-HQPA, had anticancer effects in HCC cells. These findings indicate the importance of Aurora B kinase in HCC progression and as a potential therapeutic target for HCC. Grant NSC96-2628-B-002-054-MY3 from the National Science Council (Taiwan), Grant DOH97-TD-B-111-001 from the Department of Health (Taiwan), and Grant NSC98-3112-B-075A-001 from the National Science Council (Taiwan). We thank Ms. Chia-Chi Cheng (National Taiwan University Hospital) for assistance in statistical computing. ZZL has made substantial contributions to conception, experimental design, data analysis, and manuscript writing of this study. YMJ conceived and designed the study. FCH was responsible for the statistical analysis. HWP participated in the experimental design. HWT performed the RT-PCR. PLL performed analysis of p53 and β-catenin mutations. PHL supplied tissue samples and collected clinical data. ALC and HCH participated the conception and design of the study, guided the data analysis, manuscript preparation, and reviewed the manuscript. All authors read and approved the final manuscript.